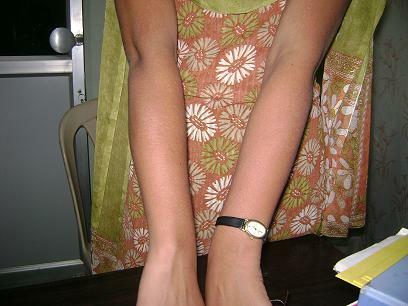 A female girl aged 19/f having whitish spot over forearm since 2 years. She has taken many allopathic medicines & Treatment from Skin Specialist with temporary relief. As She take medicine whitish discolored spot disappear. As soon as medicine stopped it again reappear. Whitish discolored spot over forearm, near elbow of both side. There is no itching. Palms & Soles are always warm i.e. Heat of palms & Soles. Same complaints since 2 years. There is no history of major or critical illness. Menarche at the age of 13 years. Menses are Regular sometime early. Menses are bright red in colour. Painful dysmenorrhoea. Aching in extremities, low back pain, pain in abdomen during menses. Appetite: She eat normally with good appetite. Thirst: Excessive thirst for ice cold water. Sleep: Normal. Starts at slight noise. Becomes sensitive to emotions of others. - Heat of palm & soles. - Menses - Painful - Dysmenorrhoea. On the basis of Dysmenorrhoea with abdominal pain, aching in extrimities, feverish feeling, hot palms & Soles. As She is having past history of epistaxis, she complaining of bleeding from nose < night, sleep during since 3 days. 3 doses early morning was given. No Epistaxis. Whitish spot disappeared completely. Improvement in general weakness & feeling fresh.